Roasting tomatoes brings out their sweetness. I make these all the time using plum tomatoes which are hearty and easy to roast. But when I saw these beautiful multicolor cherry and grape tomaotes at the store I had to make them. These little guys are very delicate so adjust your roasting time. Top with fresh basil and grated macadamia nuts and serve as an afternoons snack or appetizer. Cut the tomatoes on half. In a bowl, pour in just enough olive oil to coat the tomatoes and a dash of salt. Gently mix the tomatoes around to cover evenly. Roast on the top rack for 12 to 15 minutes or 17 to 20 for plum tomatoes. Roll the basil leaves into a little cigar and cut a chiffonade. 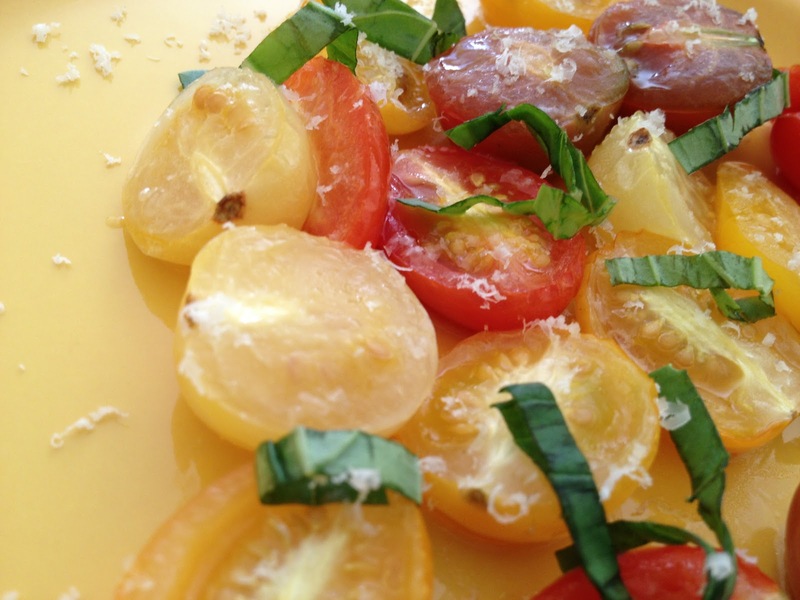 Plate the tomatoes and top with the basil chiffonade. Using a microplane, grate the macadamia nuts on top. Enjoy!